Wouldn’t it be great if you could get an effective gym experience at home? Problem is having enough space to accommodate the equipment you need – and getting your money’s worth out of it. 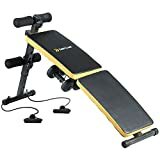 If you are planning to create a workout area in your own space, this multi-function folding ab bench is a good place to start. Designed to offer optimum versatility in the smallest possible footprint, the ab bench can be used for a variety of exercises. Obviously, it’s perfect piece of equipment for ab and core exercises. The foam padded bench has a height adjustment feature to allow a gentle or steeper incline depending on the level of effort required and there a two foam-covered foot bars to provide extra traction. But exercises are not confined to the ab and core region. We’ve also included a pair of dumbbells to help work your chest, back and shoulders and some resistance bands to provide added tension. The bench is comfortable to use and makes a great base station for your workout. It folds neatly for easy storage and features foam rollers to cushion legs during ab exercises. Bench comes with 2 x 1.5kg dumbbells and 2 x resistance bands.